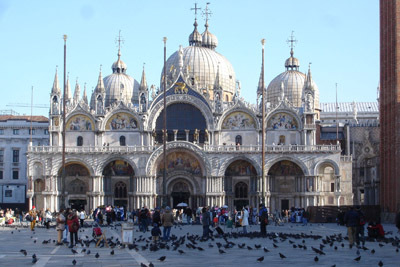 Saint Mark’s Basilica is a cathedral located on St. Mark’s Square in the city of Venice, Italy. It is one of the attractive cathedrals in the city and it is famous for its uniqueness in terms of the design and the magnificent interior as well as being an example of the Byzantine architecture. Many years ago, however, it did not serve as a cathedral. In fact, it was a chapel for the Venetian City and its rulers. Since the 11th century onwards, the cathedral was known by the nickname “Church of Gold,” or “Chiesad’Oro” in Italian. The entire cathedral of St. Mark has had both European and Italian artists working on it. That is one of the reasons why it displays the beauty and designs from both cultures. St. Mark’s Basilica is known for its artistic, iconographic as well as religious content and some have described it as being a masterpiece of Gothic sculpture and art. The entire top ceiling is covered with beautiful mosaic colors of gold and bronze, giving it a very bright and lit effect. The current basilica is the third cathedral that was built on the place because it is where Saint Mark’s body was located. It is divided into three main segments – the lower segment, the upper segment, and the domes. The interior of the cathedral depicts the Greek cross and every arm is divided into three naves.